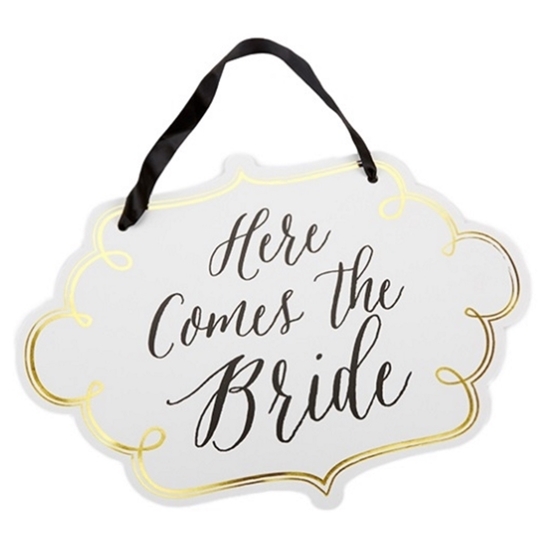 Featuring a white card stock sign with gold details and the words 'Here Comes the Bride', this sign is a great decorative wedding accessory. Featuring a black hanging ribbon, the sign is easy to place anywhere in the venue. The sign's overall dimensions are 17.7 X 14.2 inches. A sign that completes any wedding ceremony, the Here Comes the Bride Sign will relief the anticipation of guests while waiting for the bride to walk down the Aisle. In addition to the large font making it an ideal sign for its intended usage, the sign also features subtle detailing such as the golden accents that allow the sign to blend in with your existing aesthetic perfectly.